Okay I am thrilled and happy to bring you all something different, though in the world of music. 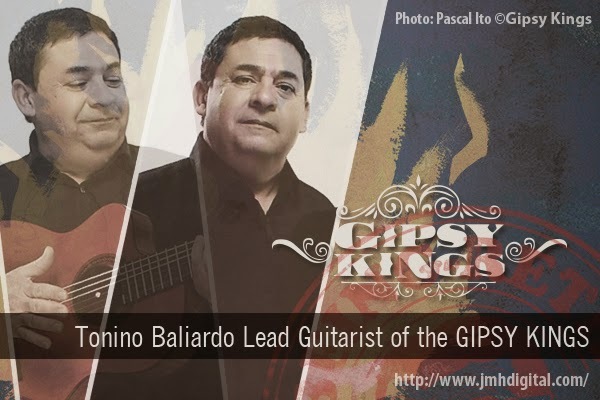 I bring you the great Tonino Baliardo Lead Guitarist of the GIPSY KINGS...who I got the great pleasure to talk with this week as the "GIPSY KINGS" come to town this weekend Sun, June 1, 2014 Chicago, IL at The Chicago Theatre [CLICK HERE FOR ALL TOUR DATES]... as they Celebrate the 25th Anniversary together, thank you Tonino and Anne for helping getting this in on their busy schedule. Jeremy [Howlin' Wolf]: How do you see the world from each tour, what are some of your favorite places? Tonino Baliardo: I see the world from a bus or a plane. Although it is not the best way to see it, I am blessed to be able to go and tour all over the world. I also get to play my music to people and share our culture with them. it is a great experience gives us the energy to be able to travel like we do. Some of my favorite places are San Francisco, Barcelona , Miami and the Caribbean. I love warm places, although the coldest winter was a summer in San Francisco! Jeremy [Howlin' Wolf]: Please tell me who you are and your contributions to "Gipsy Kings"? Tonino Baliardo: I am Tonnino Baliardo, lead guitarist, co-writer and producer of the band. Jeremy [Howlin' Wolf]: How do you feel you all have grown with the latest release "SAVOR FLAMENCO" on Knitting Factory Records? Tonino Baliardo: We are happy to be able to finally create a project from the ground up. we conceived, wrote, produced, played and recorded the project entirely on our own. We took as much time as we needed and was able to naturally create what we wanted to. It was a great experience and are so completely happy with our results. Jeremy [Howlin' Wolf]: What is the oddest and greatest item/gift you personally received from a fan? Tonino Baliardo: The greatest gift was happiness from our fans. They create the atmosphere in which we are able to play. They get so moved by our music, it is the greatest gift one can give. I wish everyone could experience that once in their life, I think the world would be a better place if they did. we are lucky to be able to experience that. The weirdest gift was a gold fish in my hotel room. I woke up one day after a date and saw a gold fish in my room, in a small bowl. I loved that fish and didn't want to leave it behind. So I brought it down to check out and the hotel asked me what I was doing. I told them that I received this fish from I guess a fan and wanted to bring it with me. They informed me that they put a fish in everyone's room and that I could not take it with me. I was embarrassed and left my friend at the front desk. Two trains passing in the night! Jeremy [Howlin' Wolf]: When on stage looking into the crowds, what do you find to help staying calm? Tonino Baliardo: When I see the audience smile, I get calm right away. Until then I am all nerves. 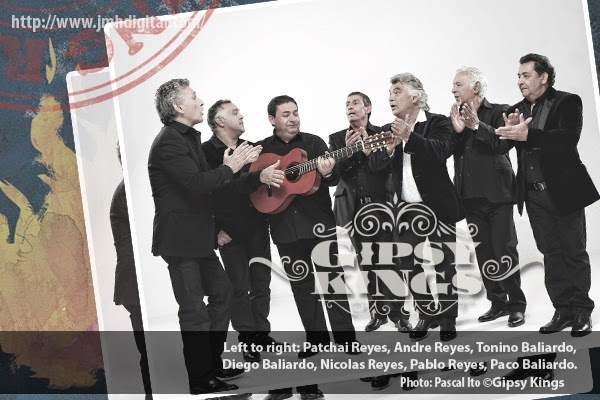 Jeremy [Howlin' Wolf]: Looking back at 25 years, what do you hope the people will take away from the "Gipsy Kings" experience? Tonino Baliardo: I hope that their troubles are taken away for those few hours. It's pretty hard traveling every day, riding in all sorts of ways, trying to get to a show. We do it because we love it and is the only way we know, however if we can just make life easier in those two hours, it makes all the difference in the he world. It's good for the soul.